Ohio’s shale production has been steadily increasing in recent years. In the third quarter of 2018, the last quarter of available data, Ohio experienced a more-than-30 percent increase in both oil and natural gas production over the same quarter in 2017. Despite the vocal opposition of fringe environmental activists, very little of that oil and natural gas development is occurring on federal lands, according to a new EID infographic. A recent series of New York Times articles suggest that a “wild west” atmosphere exists with regard to oil and natural gas leasing on federal lands at the behest of the Trump Administration and the energy industry. The Times narrative suggests that this activity is dramatically escalating, particularly in the western United States. EID debunked this narrative using Bureau of Land Management (BLM) data that show less than 10 percent of lands in the Mountain States region are actually leased for oil and gas development – and less than one percent in California. In fact, the research found that there was actually more federal leasing and permitting during the first term of the Obama administration than has occurred in the entirety of the Trump presidency. Similar to what has occurred out west, groups in Ohio such as the Center for Biological Diversity and Keep Wayne Wild have targeted the state’s only federal forest – the Wayne National Forest – as a platform to perpetuate this “land grab” myth and ultimately to attempt to ban oil and natural gas development in the Wayne. So how much of the Wayne has actually been leased for shale development? Less than six percent. 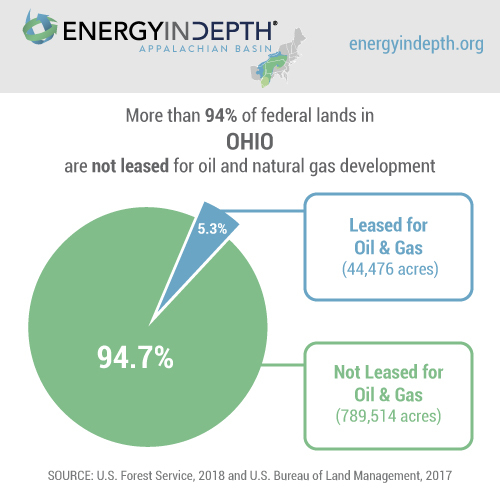 The bottom line is that Ohio’s leased federal acreage represents a small fraction of the total national forest acreage, and yet those oil and natural gas lease sales are greatly benefitting the local community.